Bridgetown, Texas, Wichita County ghost town. The town had no 19th Century history and was born with the boom of the Burkburnett oil field around 1920. 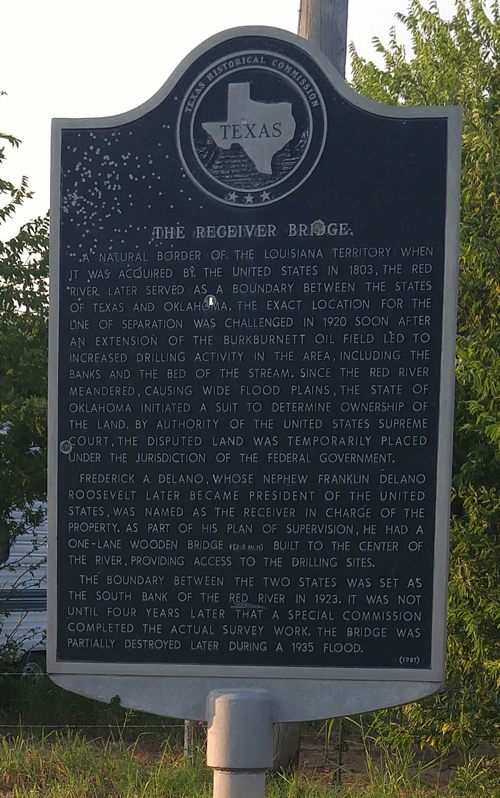 The town was named after it�s most distinguishing landmark - a one mile bridge over the Red River. The toll bridge connected Wichita County, Texas with Tillman County, Oklahoma. Although the population was transient, some permanent structures were constructed. 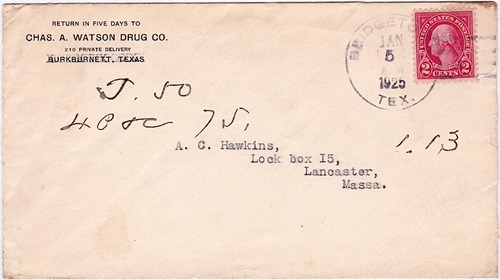 The town had a post office from 1920 until sometime in the 1930s. Bridgetown�s population went from a peak of 10,000 to a mere 100 persons in the mid 1920s. Bridgetown�s last population figures were given as eighty (in the late 1940s). 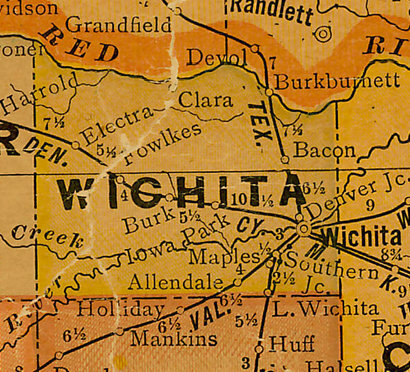 When the northwest extension of the Burkburnett oil field opened in 1919, prospectors thronged this area. 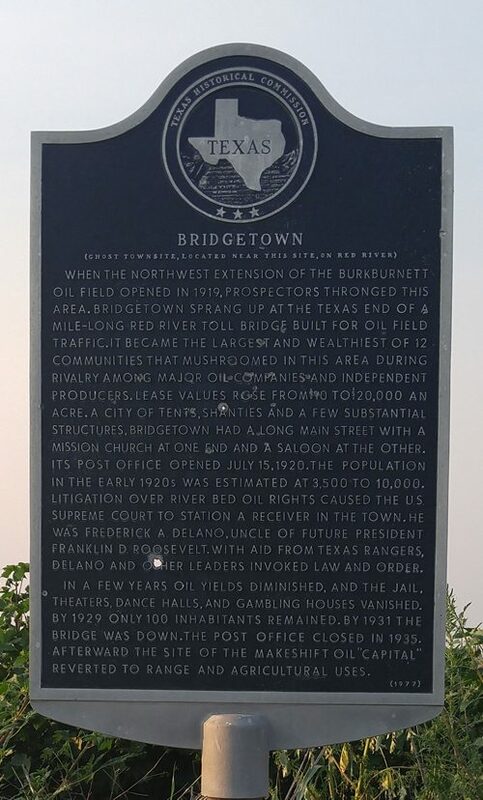 Bridgetown sprang up at the Texas end of a mile-long Red River toll bridge built for oil field traffic. It became the largest and wealthiest of 12 communities that mushroomed in this area during rivalry among major oil companies and independent producers. Lease values rose from $10 to $20,000 an acre. A city of tents, shanties and a few substantial structures, Bridgetown had a long main street with a Mission church at one end and a saloon at the other. Its post office opened July 15, 1920. The population in the early 1920s was estimated at 3,500 to 10,000. Litigation over riverbed oil rights caused the U.S. Supreme Court to station a receiver in the town. He was Frederick A. Delano, uncle of future president Franklin D. Roosevelt. With aid from Texas Rangers, Delano and other leaders invoked law and order. In a few years oil yields diminished, and the jail, theaters, dance halls, and gambling houses vanished. By 1929 only 100 inhabitants remained. By 1931 the bridge was down, the post office closed in 1935. Afterward the site of the makeshift oil "capital" reverted to range and agricultural uses. A natural border of the Louisiana Territory when it was acquired by the United States in 1803. The Red River later served as a boundary between the states of Texas and Oklahoma. The exact location for the line of separation was challenged in 1920 soon after an extension of the Burkburnett oil field led to increased drilling activity in the area, including the banks and the bed of the stream. Since the Red River meandered, causing wide flood plains, the state of Oklahoma initiated a suit to determine ownership of the land. By authority of the United States Supreme Court, the disputed land was temporarily placed under the jurisdiction of the federal government. Frederick A. Delano, whose nephew Franklin Delano Roosevelt later became president of the United States, was named as the receiver in charge of the property. As part of his plan of supervision, he had a one-lane wooden bridge (2.5 miles North) built to the center of the river, providing access to the drilling sites. Anyone wishing to share old photos of the wooden foot bridge, please submit here.